More opens. More clicks. Better email deliverability. Less spam complaints. One email can help you accomplish all of this. It’s the welcome email! Although it’s the first email subscribers receive (after the confirmation email if you use confirmed opt-in), it may be the most important email you send. And there’s no reason not to send it. Between the awesome results you can get and the ease of setting it up, the welcome email is the one email you should always be sending – no matter what. If you’re wondering why it’s so important and how you can write an amazing welcome email yourself, read this article. And then set up your welcome email. Welcome emails get amazing results. In fact, they get open rates that are 4 times higher and click-through rates that are 5 times higher than other emails. Here at AWeber, we often see welcome emails with open rates above 90 percent and click-through rates above 50 percent. That’s amazing! Welcome emails get such great results because they arrive in your subscriber’s inbox at the peak of their interest – when they’ve just signed up for your email list. And often times, welcome emails contain the incentives businesses promise on their sign up forms. So subscribers are eagerly awaiting those emails and their freebies. At other times, subscribers are excited about signing up for a newsletter, and the welcome email gives them a sneak peek into what they’ll be receiving. But there are a few key things you should do in your welcome email to earn these kinds of results. In fact, there are five things every welcome email should include. Keep reading to learn about them. If you promise a freebie or incentive on your sign up form, your welcome email should deliver it. You should design and structure your email in such a way that the incentive is prominent when subscribers open the email. Making sure that subscribers see your incentive is important, because it builds trust by delivering on your sign-up-form promise. Additionally, a good incentive can get people excited about receiving more content from you – which can lead to higher open rates and click-through rates down the road. When you deliver your incentive in your welcome email, you can use hyperlinked text like we did above, or an eye-catching button. Either way, your incentive should be easy to find in your welcome email. If you don’t promise an incentive on your sign up form, then you don’t need to worry about this step. Instead, try sharing a popular blog post or another piece of content that provides value to your audience. Earlier in this post, I mentioned that welcome emails can increase deliverability and help more of your emails reach the primary inbox. To make this happen, ask subscribers to whitelist you in the copy of your welcome email. Whitelisting is when a subscriber adds your sender name to their email contacts. When an email provider such as Gmail recognizes that you’re in the subscriber’s contacts, they’ll be sure to deliver your email. You can ask someone to whitelist you by providing instructions for how to do so. Another even simpler way to have subscribers whitelist you is to ask them to reply to your email. By replying to your email, your subscriber will automatically add you to their email contacts. Setting expectations in your welcome email is a great way to decrease spam complaints and discourage unsubscribes. You can set expectations by explaining how frequently subscribers will receive emails from you and by walking them through the kind of content they’ll receive. If you tell subscribers up front that you’ll be emailing them daily, for example, they’ll be less likely to mark your emails as spam, because they’ll be expecting daily emails. Additionally, when you inform subscribers of the kind of content they’ll get from you and you stick to those guidelines, subscribers may be less likely to mark your emails as spam or unsubscribe, because they’re aware of the kind of content you send. Typically, you should not try to sell anything in your welcome email. Doing so is like getting a cold call from a salesperson. While that can work on occasion, many times it just annoys the person receiving the call, because they don’t have a relationship with the caller. However, the welcome email is a good opportunity to begin establishing a relationship that can lead to sales later on. By introducing your company (or brand) and mission in your welcome email, your subscriber can begin to become familiar with you. This familiarity can carry over to later emails and make your subscriber more likely to purchase since they know who you are. In this welcome email, Melyssa Griffin spends a lot of time introducing herself, her mission and who her ideal audience is. When an entrepreneur reads this email, they know that Melyssa is specifically trying to help people like them, because she says so in the email. That can go a long way in encouraging people to trust and purchase from her later on. Your welcome email plays an essential role in establishing your relationship with a subscriber and in setting up how they interact with your emails in the time after they subscribe. A well-written welcome email can increase open rates and click-through rates for months after your subscriber receives it. One way it does this is by building excitement for the emails that’ll be arriving later on. You can accomplish this by explaining the benefits of being on your list and teasing the content that subscribers will be getting from you. This is similar to setting expectations, except that the goal is to use language, sentences and words that’ll get your subscribers as excited about receiving your content as a child is excited about opening their birthday presents. Nomadic Matt, a travel blogger, builds excitement in his welcome email by telling subscribers they’ll get, “amazing tips, tricks, and deals sent to you so you can travel more on less.” He then allows them to choose the type of travel content they want to receive from him by having them select the country they want to travel to next. And that’s it! When your welcome email accomplishes these five things, you set yourself up for email marketing success. Ready to write your own welcome email? We’ve made it really easy. 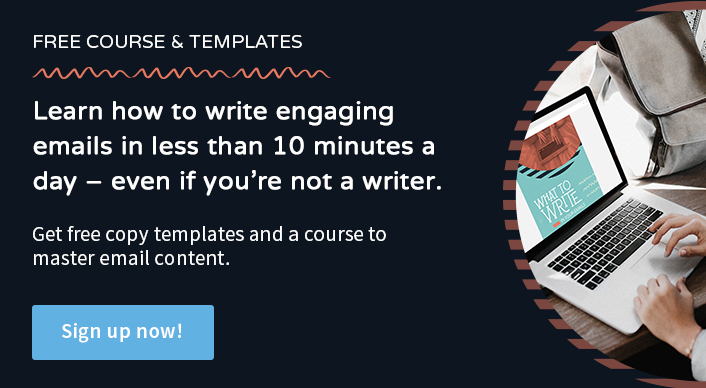 Our free “What to Write in Your Emails” course and guide gives you 5 fill-in-the-blank templates (and 40 other templates! ), which you can use to write a welcome email in minutes. All you’ll need to do is fill in the blanks in the templates with your own information and then add your content to an email. It’s that simple! Sign up for the “What to Write in Your Emails” guide and course today, and start sending welcome emails. Just out of curiosity….I’m wondering if it’s okay to send e-mails “preferably the e-newsletter after the welcome email message” with affiliate links in it. What’s your thoughts on this? It’s definitely OK to send emails with affiliate links in them as long as you disclose that they’re affiliate links. Adding affiliate links to emails is a great way to monetize your email marketing. An open rate of 90% is amazing however it makes sense if people are getting their incentive delivered and are excited about receiving your emails. Asking customers to white list your emails in that first welcome email makes a lot of sense. This alone must really help to increase your open and click through rates. Thanks for the article. You’re welcome, Neil! Yes, that’s the power of welcome emails – really amazing engagement. And whitelisting is often underutilized, but it’s very effective. A very well-developed post with Excellent guidance.